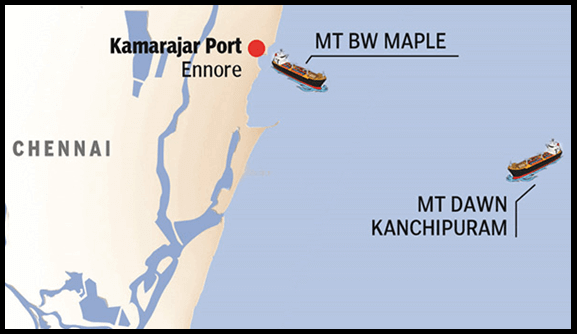 On 28 January 2017 two ships collided off Kamarajar Port Limited’s (KPL) harbour and resulted in a major oil spill disaster. The Chennai Oil Spill resulted in irreversible environmental damage. The spill has also underscored the incapacity of the state to handle such incidents and has raised many questions regarding our disaster management techniques. It points that it is high time for India to have a working contingency plan to handle such future incidents. Chennai Oil Spill: Was it the first instance of the oil spill in India? The answer is NO. There were many other incidents in the past as given below. Sundarban: In 2014 Oil spill in Bangladesh created an environmental concern for India too. An oil tanker sank in Sela River which is an eco-sensitive region of Sundarban triggered the disaster. Indian wildlife too was badly affected. ONGC Leak: In 2013 ONGC Uran plan developed a leak which resulted in 5,000 litres of the crude oil spill in the Arabian Sea. Mumbai coast: In 2010 two ships collided off the Mumbai coast causing the oil spill. 800 tonnes of oil leaked before the leaked was plugged two days later. What are the main causes of Oil Spills? Natural causes: Tsunami, Cyclone, Thunderstorm etc. Human Causes: War, attack, sabotage, human mistakes leading to a collision or some technical reasons. What are the major impacts of Oil Spill? The most affected organisms are those which floats near the surface like turtles, fishes, crabs etc. Sea animals caught in an oil spill, on being exposed to toxic petroleum products often results in lower reproductive rates, organ damage, and death. The effects remain for a long period of time. Fishes die due to inability to swim or breath. Note: This time was core breeding period for olive ridley turtles and due to oil slick sticking to the gut mother turtles may find it difficult to lay the eggs. Many birds die due to drowning or inability to eat due to oil sticking to their body. Direct exposure can have varying effects depending on the toxicity and chemicals involved in the spill. Humans get exposed to toxicity through breathing gaseous oil compounds and/or oil compounds adsorbed on particulate matter (dispersed through the air). Exposure can also happen due to the activities in the contaminated ground (e.g., soil) or through skin absorption when touching spilled material. There is a huge economic cost attached with such disasters. Is there a law in India which cover an Oil Spill Disaster? In India, there is no law covering oil spill as such and its consequential environmental damage. These incidents are not covered as an oil spill but as an accidental discharge as defined in the Environment Protection Act (EPA) of 1986. Usually, FIRs are filed under EPA and according to IPC sections relating rash navigation and endangering the life of others. But India has “the National Oil Spill Disaster Contingency Plan of 1996 (NOS-DCP)” to handle such situations. The document was issued by the Ministry of Defense in 1996; it was last updated in March 2006. 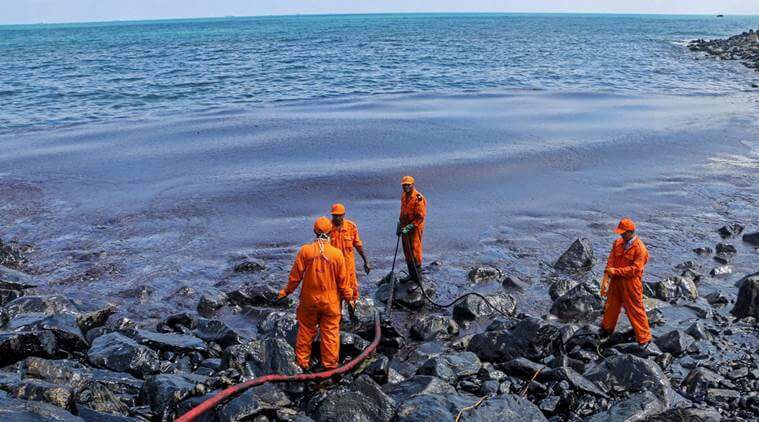 It gives the Indian Coast Guard the mandate to coordinate with state departments, ministries, port authorities and environmental agencies to assist in oil spill cleaning operations. It mandates that all major ports in India should have basic, minimum equipment, like inflatable booms and oil skimmers, to tackle oil spill. It highlights the responsibilities for individual Ports. The NOS-DCP was revised in 2015 to meet international standards. Online Oil Spill Advisory System was set up. Mapping of environmental sensitivities in coastal zones. Deployment of aerial dispersant spray system. Facilitating regional oil spill contingency plans. In 2015 India ratified the International Convention on Civil Liability for Bunker Oil Pollution Damage, 2001 (Bunker Convention). Convention ensures adequate, prompt and effective compensation for damage caused by oil spills. An international forum on oil spill prevention, preparedness, response and restoration systems was constituted in 2011 viz. Oil Spill India (OSI). In 2016 September there was a convention in Mumbai of OSI. Convention showcases best practices in the world for oil spill preparedness. The government agencies often pass the blame and responsibility to each other when asked about fixing liability and accountability. 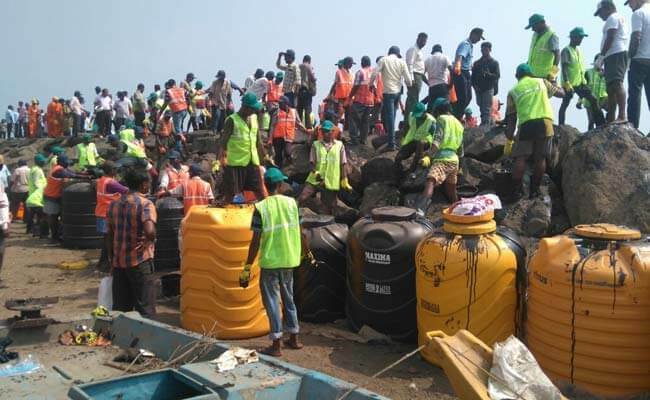 During recent Chennai disaster, Coast Guard men, engineering students, and fishermen were seen using their hands to clear the oil spill in the sea. At least 1,000 volunteers were employed for physically removing blobs of oil deposited along the beaches. Though the participation from different quarters is necessary, precautions must be taken to protect the health of volunteers due to the exposure to toxic chemicals. Companies can use their CSR obligations for better by helping capacity building or by sponsoring the necessary equipment during such drives. What are the problems faced in the oil-remedial processes? Petroleum oils are complex mixtures of chemicals that are toxic, bioaccumulative and persistent in the environment. Some, like benzene, are known human carcinogens. They enter the body through inhalation, ingestion and the skin. An oil spill clean-up is a hazardous waste remediation exercise. 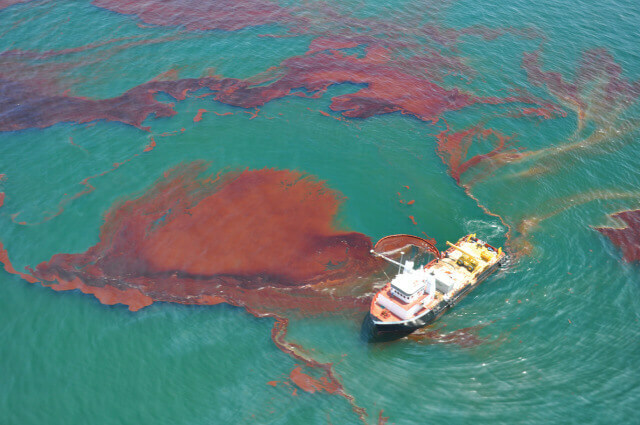 Many traditional methods of cleaning oil spills, such as breaking up the oil with dispersants or skimming it off the surface, are expensive, slow, and unsafe – and often don’t really work all that well anyway. During the recent disaster, authorities starting pumping oil sludge by city water pump but all in vain. Later on, volunteers skimmed off the oil using buckets in hand which can be very dangerous for individuals. What are the available technological solutions? Oil Zapper is a cocktail of bacteria that feed on the oil and degrade the hydrocarbons. absorb 33 times their weight in oil. One gram of nanosheets has the equivalent area as nearly 5.5 tennis courts – so a lot of surface for absorption. Saturated nanosheets can be simply heated in air for two hours for cleaning purpose. The absorbed oil burns off, leaving the nanosheets clean and free to absorb again. Easy to build and affordable. What is the aftermath of the Oil Spill accident? Even weeks after the accident, there is no clarity on the quantity and nature of the material that spilled on January 28. After the oil spill, another disaster is unfolding – by exposing volunteers to the unknown amount of toxicity. There is a hurry to declare the clean-up operation complete. No advisories on the toxicity of the spilled material have been issued. No protocols or defined procedures are adopted in the cleanup. Not just the water but rocks also need to be cleaned up using warm water or foam. 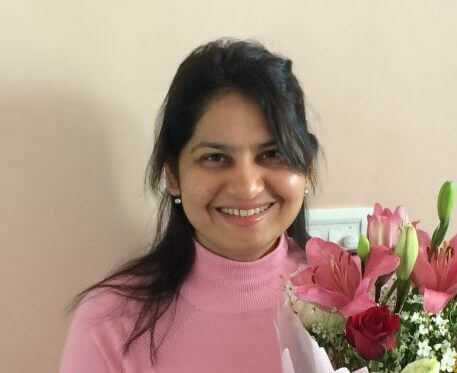 With increased trade and energy demand in future, there is always some possibility of such disasters and India can provide such services on demand making it an area of expertise and gaining soft power. India has resources and manpower to handle such situations not for itself but also for the neighbours. After the tsunami in India, some preparedness may be in place; whether they are good for oil spills is another matter altogether. But the ecological knowledge of this unit is the key. A good opportunity to establish India’s importance came during Sundarban disaster but due to many reasons, nothing good was achieved. The Chennai oil spill incident raises many questions. The true extent of the damage to the ecology and economy will be known only after some time. But it is apparent from the disarray that works done seems far from a contingency plan. The Indian government is endeavouring to increase its port capacity and connectivity through various schemes like Sagal Mala Yojana but disaster preparedness of ports remains in shadows. There is an urgent need to increases preparedness for handling the responsibility that comes with large-scale coastal development and operations. To prevent such disaster in future, we need contingency plan which can work on the ground too and not just in papers. The government of India and state government must coordinate and take hard steps for betterment. 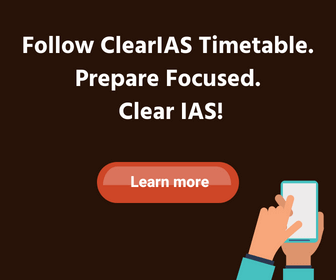 In the future, we need good management and credible timely information to manage the situations and thus minimising the exposure to an oil spill.